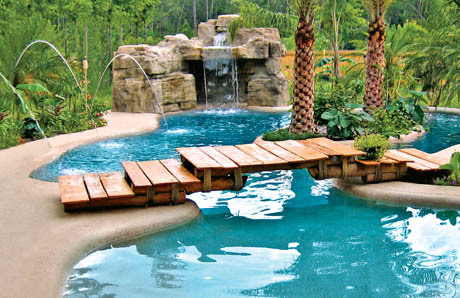 No longer limited to lavish swimming pools at resort hotels and homes of the ultra-wealthy, waterfall grottos are now common in backyards across America and can be the perfect complement to a lagoon-type pool. A grotto typically is defined as a large rock waterfall with a nook or cavern-like space beneath it that’s large enough to swim into. Depending on the size, style, and configuration, a grotto can contain features like seating areas, lighting, or a therapy spa. 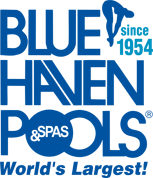 They provide privacy and shade for swimmers, and kids can use them for imaginative play scenarios. Large, elaborate installations are similar to actual sea caves from which swimmers can fully exit the water to lounge, have cocktails at the grotto bar, or get snacks from a built-in kitchen! 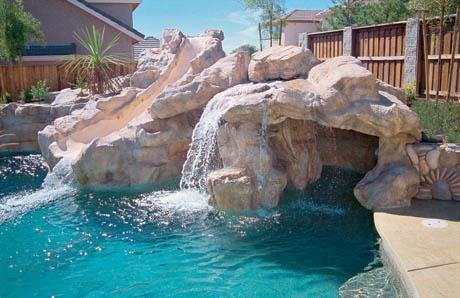 While that kind of ultra-deluxe grotto requires an ultra-deluxe budget, there are plenty of dramatic, beautiful grotto designs that an upper-end—yet realistic—pool budget can accommodate. 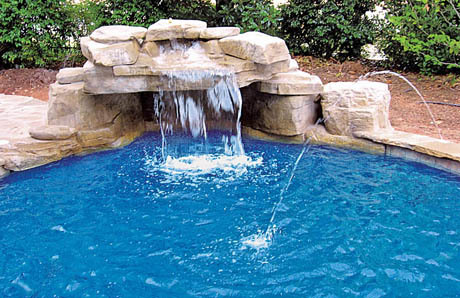 Waterfall pool grottos can be built using natural stone, engineered concrete that is sculpted to resemble stone, or prefabricated modular faux rock—which is the most affordable option. Depending on the area of the country, the size, style, and the material used, a basic design with seating like a love bench can start at around $10,000. Many distinctive grottos that pack the “wow” factor—including ones pictured here—can run in the price range of $20,000 to $40,000. Again, construction and material costs vary in different markets. 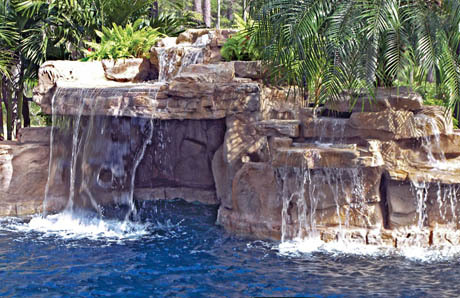 Here are examples from around the country that help you see what kinds of grotto-waterfall designs you might be able to include with your new backyard resort. 1. 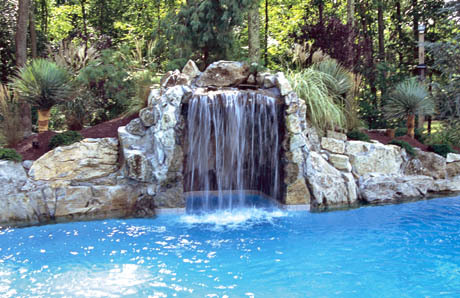 This mid-size project in southern New York state illustrates a typical, mid-size grotto that is constructed from natural stone and that has room for several swimmers inside. 2. 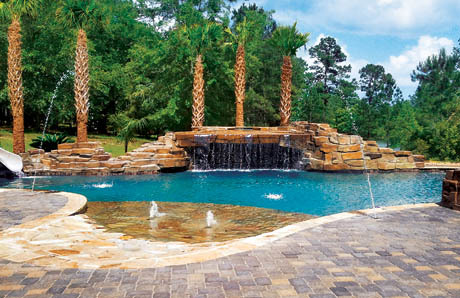 In Pensacola, Florida, this large grotto—constructed from cost-effective artificial rock—provides the ideal centerpiece for the lagoon-style pool. 3. 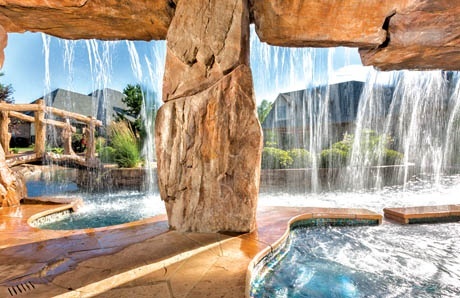 The interior view of this grotto near Oklahoma City illustrates how a spa can be integrated into an installation, where it provides relaxing hydrotherapy in a cool, shaded space. 4. In Northern California, this engineered-concrete grotto is great for kids to enjoy with its pool slide and an inside area that is almost like a miniature cave. 5. Built with natural lava stone, this grotto in the Philadelphia area creates a towering presence over the entire swimming pool. 6. A combination of artificial rocks and carved concrete (a form of engineered concrete)—which was then stained to resemble natural stone—was used to create this wide grotto in Mobile, Alabama. 7. With its lush landscaping, this faux-rock grotto in Orlando, Florida captures the quintessential, natural style that many homeowners seek. 8. 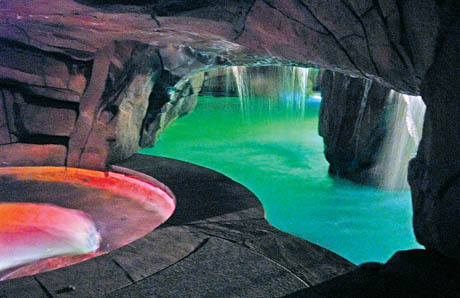 Color-changing LED lighting illuminates this cavernous Las Vegas, Nevada pool & spa grotto, which is built using engineered concrete that designed to resemble stone. 9. In Charlotte, North Carolina, this miniature grotto illustrates a small-scale design built using a system of prefabricated, modular artificial rock. In most regions, a design like this—or a similar one in natural stone, will run well below $10,000. 10. 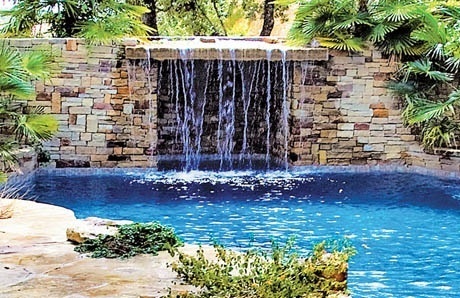 At this San Antonio backyard, one full end of the swimming pool is built with a “grotto wall” that is constructed with random chopped Oklahoma Stone. 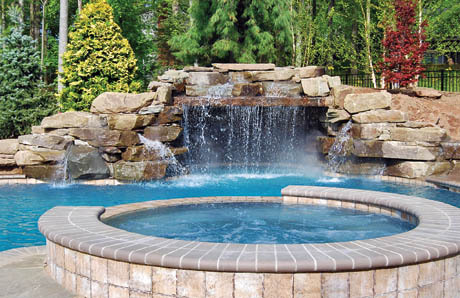 When considering a grotto, discuss options with your swimming pool builder regarding size, features, and the materials. Be sure to ask which kind of material has the best price in your area, and know that using pre-cast concrete offers more design flexibility, but will almost always cost more than natural stone.